With Canada’s West Marketplace (CWM) being hosted in Kelowna this year, Tourism Kamloops had the opportunity to work closer than ever with delegates attending the tradeshow. For a first time initiative, Tourism Kamloops partnered with 3 other community stakeholders to co-host a 3-day CWM Pre-FAM that was very well received by attending delegates. Delegates had the opportunity to enjoy Kamloops’ local flavours such as Fireside Steakhouse & Bar, The Noble Pig and Monte Creek Ranch and Harper’s Trail wines as well as tying unique Kamloops products such as Tranquille Farm Fresh Tunnel Tours and Shuswap Unique Adventures Segway Tours. From there Lisa Strachan and Tara Look attended the day and a half tradeshow in Kelowna with a full appointment schedule of over 40 appointments. All of the appointments were very productive and we are currently in the process of providing follow-up information to the delegates that Tourism Kamloops had met with. 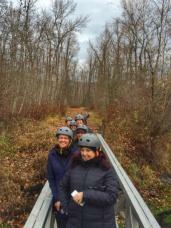 Tourism Kamloops was also provided the opportunity to co-host a CWM Post-FAM working in partnership with TOTA and Sun Peaks. 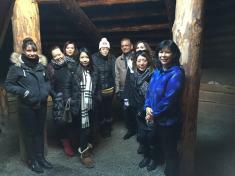 Delegates had the opportunity to spend 24 hours in Kamloops, taking in product that is not only uniquely Canadian, but uniquely Kamloops such as a Blazers Hockey Games and exploring a pit-house at the Secwepemc Museum & Heritage Park. Delegates came away with a better understanding of what their guests can experience in Kamloops and new ideas to include in their 2016 and 2017 itineraries. Lisa recently returned from the Canadian Inbound Tourism Association Asia Pacific (CITAP) Winter Function that was held in Richmond, BC on December 3rd. This was a full day of learning about the Japanese, Chinese, Taiwanese, Indian, Korean and South East Asian and markets as well as participating in a 4 hour trade show where buyers walked around and gathered information about destinations, accommodations and attractions. Lisa has been attending the CITAP Winter Function for 5 years now and says it was the best year yet. The trade show sold out of booth space and there was close to 250 buyers walking around gathering information. Lisa had some very productive conversations and will be following up with requested information about Kamloops. Lisa sits on the product development committee for CITAP.